Gerhard Schröder was the seventh Chancellor of the Federal Republic of Germany, a position he held from 1998 to 2005. His chancellorship was marked by extensive social and regulatory reforms, as well as a growing awareness of Germany’s global responsibility. 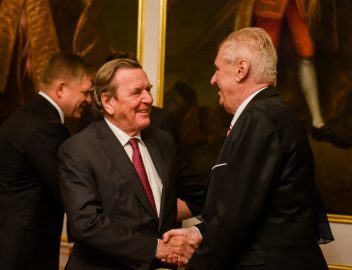 After he left political office Gerhard Schröder resumed work as a lawyer in a private firm in Hanover and accepted a number of honorary positions. 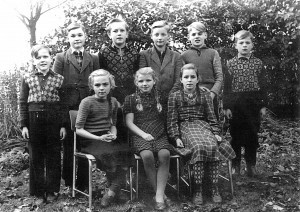 Gerhard Schröder (far left) with classmates in the 1950s (photo credit: DPA). 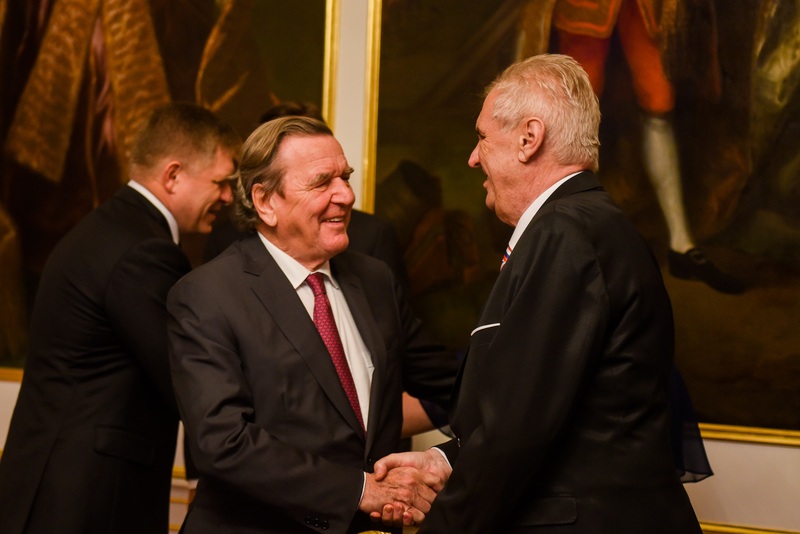 Gerhard Fritz Kurt Schröder was born on 7 April 1944 in the village of Mossenberg, in what is now the state of North Rhine-Westphalia. His father, a German soldier in the Wehrmacht, was killed in Romania in the Second World War while Gerhard was still an infant. He, his sister, and their three half-siblings grew up in poverty. The family first lived in a plain shack in the village of Bexten; later they moved to Talle, a small settlement in the Lippe district. His mother, Erika Vosseler, worked as a cleaning lady, while the children had to help local farmers in the fields and stables. When Erika died, at the age of 99, the family wrote in her obituary, “We called her a lion, because she fought her whole life for us.” In his youth, Gerhard Schröder was a passionate soccer player, and played forward for the club TuS Talle, where his teammates called him Acker, a nickname meaning “the plough.” As Schröder would later recall, success in soccer was an important source of social recognition for him. 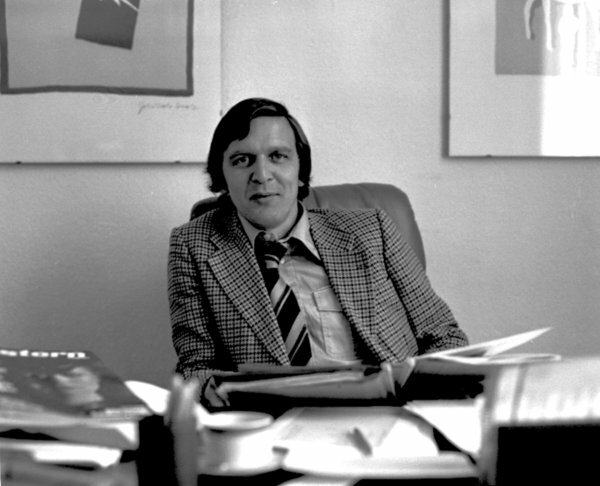 Gerhard Schröder as a young attorney in Hanover in 1977 (photo credit: AP/Fratzer). Schröder attended school from 1950 to 1958. Afterward he completed an apprenticeship in retail sales at a convenience store in the small town of Lemgo. On account of his family’s poverty, his mother could not afford to pay school fees, and he was unable to complete high school. Undeterred, Schröder took advantage of the adult education courses offered by the state. In 1962 he moved to the college town of Göttingen, where he earned his diploma at night school while working days at a hardware store. In 1966 he passed the Abitur exam after attending an institute of continuing education in Bielefeld, formally qualifying himself for university education. At the age of 22 Schröder entered law school at the University of Göttingen. He paid for his studies with the money he received as a scholarship student of the Friedrich Ebert Foundation and by working at construction sites. He completed the first state examination in 1971. His thesis examined the subject of Berufsverbote, the controversial practice of disqualifying individuals from certain professions due to their political convictions. Afterward he clerked for a private law firm and the Hanover district court. In 1976, he passed the second state examination, thus earning his license to practice law. He joined a law firm in Hanover, and then in 1978 started his own practice. Gerhard Schröder in 1979 as chairman of the SPD’s youth organization (photo credit: J.H. Darchinger/Friedrich-Ebert-Stiftung). Gerhard Schröder joined the Göttingen branch of the German Social Democratic Party (SPD) in October 1963. 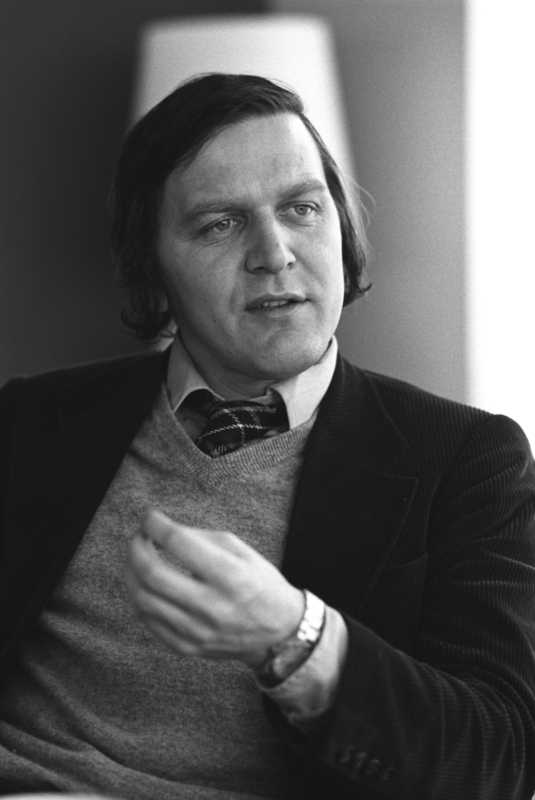 He had been inspired by Helmut Schmidt, the then interior minister of Hamburg and later Bundeskanzler. He became active in the SPD’s youth organization, and was appointed its national chairman in 1978. During the 1980 federal parliamentary elections, Gerhard Schröder ran in the Hanover district and won by direct vote. He retained his seat in the Bundestag until 1986, when the SPD made him frontrunner in the state parliamentary elections in Lower Saxony. Though the SPD gained considerable ground, it failed to achieve a governing majority, and Schröder assumed the opposition leadership. At the next round of state elections, in 1990, the SPD came out on top, making Schröder the new Minister President of Lower Saxony as head of an SPD-Greens coalition. 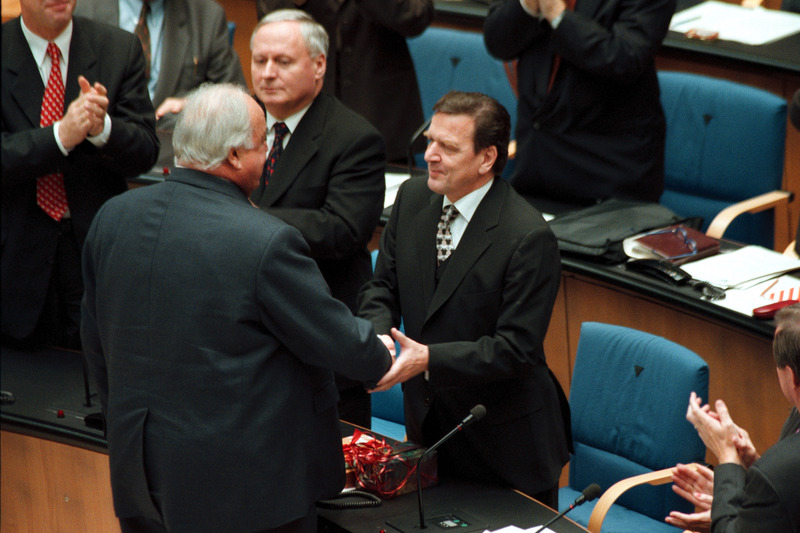 Helmed by Schröder, the SPD became the sole party in power after winning absolute majorities in the 1994 and the 1998 state elections. Helmut Kohl congratulates Gerhard Schröder on his election as Chancellor of Germany on 27 October 1998 (photo: Marco Urban). After Schröder’s 1998 victory in Lower Saxony, he was nominated as the SPD candidate for Chancellor. In the 1998 federal elections, the SPD won 40.9% of the vote, making it the strongest national party for the first time since 1972. On 27 October 1998, Schröder was officially appointed Chancellor of Germany. As in Lower Saxony, he formed an SPD-Green Party coalition. In 1999 he assumed the national chairmanship of the SPD after the resignation of Oskar Lafontaine – a position he held until 2004, when he ceded it to Franz Müntefering. In the 2002 general elections, the SPD, with Schröder once again as its top candidate, won 38.5% of the vote, the first time in history the SPD had emerged as the strongest party in consecutive national elections. During his second term as Chancellor, Schröder formed another coalition with the Greens. The years from 2003 to 2005 were shaped by heated debates surrounding the Iraq War and Agenda 2010, whose social reforms sparked sharp controversy within segments of the SPD as well as in German society as a whole. Fearing that the SPD would lose its political majority in the Bundestag, Schröder called for a vote of confidence on 1 July 2005, in the hope that this would trigger new elections and provide a new mandate for the reforms he believed were needed by Germany’s welfare system. Early elections took place as planned in 2005, but the SPD was narrowly defeated by the center-right CDU/CSU, 34.2% to 35.2%. A new, grand coalition was formed made up of the CDU, the CSU, and the SPD under the leadership of Angela Merkel. After Merkel took office as Chancellor of Germany on November 22, 2005, Schröder resigned his Bundestag seat and retired from active politics. honorary chairman of Nah- und Mittelostvereins (NuMOV), which seeks to improve relations with Middle East countries.